Mobile entertainment startup mSpot is debuting its free music cloud service today that allows you to sync your entire music collection across Android phones and PCs/Macs to the public today. The service, which was launched into private beta in May, streams music to your browser and Android phone. Here’s how it works. The service’s application that operates in the background of your computer managing the upload and day-to-day syncing of your music library. In addition, it can upload playlists, coverart, ratings and song information you may have entered using iTunes. The application will manage your music for you, making automatic updates whenever changes occur in your library, and on across different connected devices. 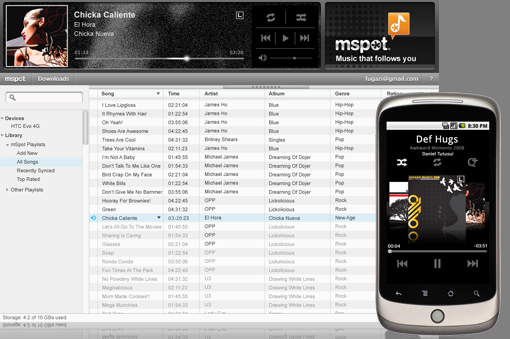 And mSpot’s cloud service automatically re-syncs music when new songs and albums are added. The service also promises to handle transitions between spotty and solid coverage areas and reduces data charges on your mobile plan. Other features include the ability to see lyrics of songs and to make a ringtone out of any song. technology that allows users to play songs from the cloud instantly for four years. mSpot mobile application automatically senses network conditions and adapts playback accordingly even without network coverage. While mSpot offers free storage for the first 2 gigabytes (approximately 1600 songs), additional storage is available for purchase ranging from 10 gigabytes (8,000 songs) for $2.99, 20 gigabytes (16,000 songs) for $4.99, and 50 gigabytes for 9.99.
mSpot’s streaming service will be incredibly an useful application for Android users. But that’s until Google launches its own cloud-based music streaming service, which is expected to take place later this year. The company even acquired streaming technology Simplify Media to boost its service. Lala did this as well, but Apple has shut that service down after acquiring it. And we expect that Apple will be launching a cloud-based version of iTunes soon, which would also pose a serious threat to mSpot’s offering. Mspot is best known for its Mobile Movies site, which will let users stream full-length movies on their mobile phones, on the web, so you can enjoy mSpot’s online streaming movie service on your computer. mSpot has struck deals with Paramount, Universal, Image Entertainment, and Screen Media Ventures to stream full-length movie rentals to users’ PCs and cell phones, allowing you to switch between both devices as you pick up and leave off throughout a movie. The PC streaming functionality builds upon the mobile movie service mSpot launched last year. The service, which just launched an iPhone app, includes 1000 titles that can be streamed to both a computer and mobile device.